Last week, we explored how to sell your book by picking suitable book categories. Today, we are going to explore the magical world of keywords. If you’ve spend five minutes searching the Internet to learn about advertising or online marketing, you’ve heard of keywords. Or at least you’ve heard the term. So what are they? In case you haven’t caught on, selling your book is really tricky NOBODY knows your name. To continue this example, big bucks are spent on authors that **wink wink** don’t need it. When James Patterson releases a new book, do you REALLY think his publisher has to hire live actors and dress them up as Secret Service agents standing by a mock Whitehouse at a London book rally? They probably don’t. But they can afford it because he rakes in BIG SALES. A keyword is comprised of one or more words. That factoid doesn’t doesn’t sound like much, but it is. What you are looking for are combinations of words that other people have used before. We could be talking at Google, at Amazon, or wherever. But the key is, you can your book associated with things people are searching for. Cuz hopefully, the NEXT person that searches that phrase will find YOU. How do you find a keyword? And so how do you find these magical words that let people beat a path to your door? The simplest thing is to start typing combinations of words that describe your book. In this day and age, Google and Amazon have instant search. Lists pop-up, trying to guess what you’re typing. It’s based on what you and others have typed in the past. You can use this to divine combinations others have searched. So, experiment. Try different combinations. Write them all down. One tactic mentioned by Dave Chesson is to type your core keyword, and then add an “a”, looking for “a”-words. Then “b” for keyword + “b”-words. Then “c”, and “d”, and so forth. This is a great way to unearth some keywords, but a small nugget of information is missing. How many have searched each of those keywords? How many other books are linked to those keywords? How are sales related to those keywords? Essentially, which keywords have the best money relative to smallest amount of competition. In other words, which keywords are not overused but still yield some decent sales. 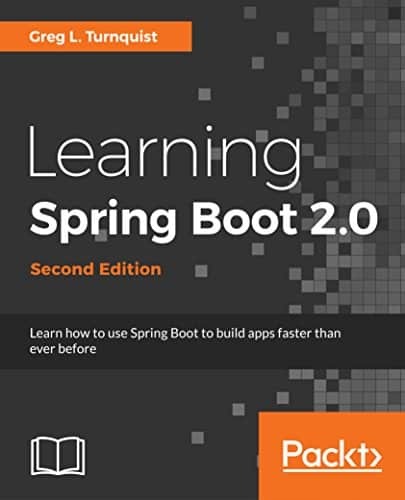 Which brings me again, to this fabulous tool: KDP Rocket. Click on “Keywords” on the top-left of KDP Rocket. Enter “coming of age” as my search criteria. Right off the bat, it shows me number of works using the same keyword (competitors), Google searches/month, and Est. Amazon searches/month. 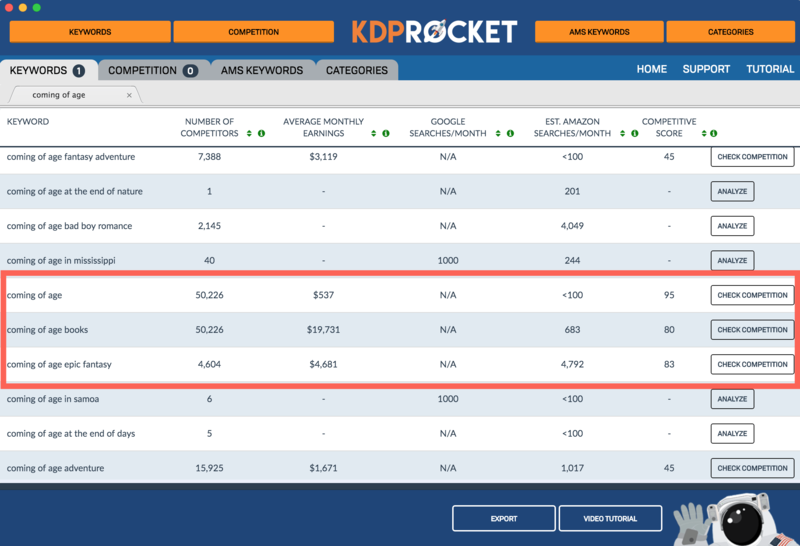 By clicking “Analyze” on the ones I was most interested in, KDP Rocket dug up Average Monthly Sales as well as a Competition Score. The Competition Score ranges from 0-100, with 100 being the most competitive ranking, i.e. too MUCH competition. Looking at the results, the highlighted ones show some of the best average revenue, but also the highest competition. Looking at the top and the bottom, lower competition scores are shown for both “coming of age fantasy adventure” and “coming of age adventure”. These right away show potential keywords that others are searching for and may not be AS popular as some of the others. And both are candidates I can choose to help pave a path to my door. Using KDP Rocket, you can brainstorm a fistful of keywords in probably ten minutes or less. So what do you do with this info? On the KDP Dashboard, where you upload your book and set all the details, one of the spots lets you pick up to seven keywords. (Again, seven DIFFERENT combinations of words). If you’re self publishing, you do it yourself. At any time, you can update your keywords. If your are publishing through a small press, you must send the information to your publisher and ask that they apply these changes. I actually revised the keywords for ALL of my wife’s titles after getting my hands on KDP Rocket. Finally, sit back and see if that doesn’t help your sales grow. Depending on the rarity of the keyword you pick, you might notice a keen difference. That combined with all the other things we’ve discussed will definitely help get your book out there. And make money!